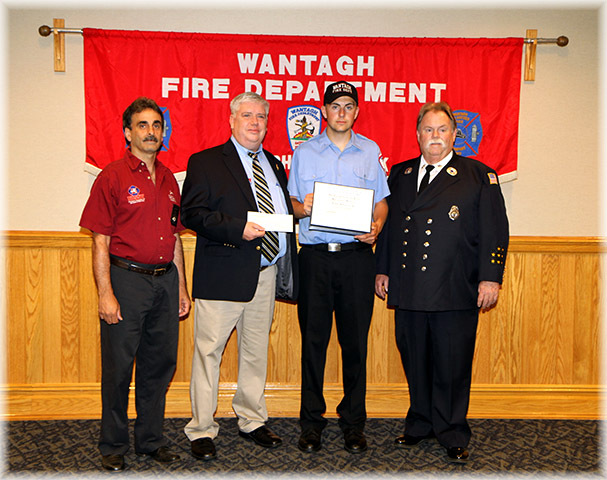 On behalf of the Firemen’s Association of the State of New York (FASNY), FASNY Scholarship Awards Committee Chairman Brian F. McQueen has announced James McCarron Jr. of Wantagh, NY as a local recipient of the FASNY Gerard J. Buckenmeyer Volunteer Scholarship. At his award ceremony on June 12, 2014, James received a certificate as well as a check for $1,500 for his volunteer service in the community. James McCarron Jr. graduated from Wantagh High School in Wantagh, NY and will attend SUNY Maritime College where he will major in Mechanical Engineering. He is a member of the Varsity Golf and Varsity Ice Hockey Teams with the Wantagh Seaford Baymen. James is a second generation volunteer firefighter and applied for the scholarship because of this new chapter in his life and to better his future endeavors. James was one of 15 students chosen for this scholarship. A total of 79 students throughout the state applied for this scholarship, which was the highest number ever submitted in the history of this award. Founded in 1872, the Firemen’s Association of the State of New York (FASNY) represents the interests of the more than 92,000 volunteer firefighters and emergency medical personnel in New York State. For more information, visit www.fasny.com.